Once upon a time, there was a kingdom named Medang Kamulan. The kingdom has a king named Prabu Dewata Cengkar. That king was a cruel and liked to eat human’s flesh. Everyday, the king always ate a human which brought by Patih Jugul Muda. The people became worried. Every time, there always a villager that gave to the king. A little half of the people who scared then decided to moved to other village because they didn't wanted to be the person gave to the king. Besides, in the Medang Kamulan village, there was a man named Aji Saka. He was a powerful man and kind-heart. Everyone in that village loved him. One day, when Aji Saka was hanging out to the forest looked for firewoods, he saw there was an old man hitted by two robbers. And he hated that so he shouted at the two robbers. “Hey you! Its not good to attack an old man.! Its not polite! Stop that now!.” Heard that shouting, the two robbers are just laughed at him. One of them said, “hahaha. Who are you? You are brave enough! Don’t act like you are a hero in front of us". “All of the cruelness and injustice is my fields. Now, let the old man free or you’ll get the punishment!,” Aji Saka said. Because of the two robbers didn’t wanted to let the old man free, Aji Saka did his magic immediately. So they were fighting. Not longer after that, Aji Saka could defeat them and they ran away from him. Aji Saka asked about the old man condition and the old man thanked to Aji Saka. Aji Saka asked the old man where did he comes from and the old man said he was from Medang Kamulan kingdom. And the old man told Aji Saka that he was trying to got out from that kingdom because of the cruel king but he didn’t have any relatives. Heard that story, Aji Saka felt so pity to that old man so he offered the old man for a living in his house. Aji Saka assumed the old man was his father. Aji Saka always recall about the story of Medang Kamulan and the cruel king which the old man had told to him. He felt so pity for the villagers and workers there. 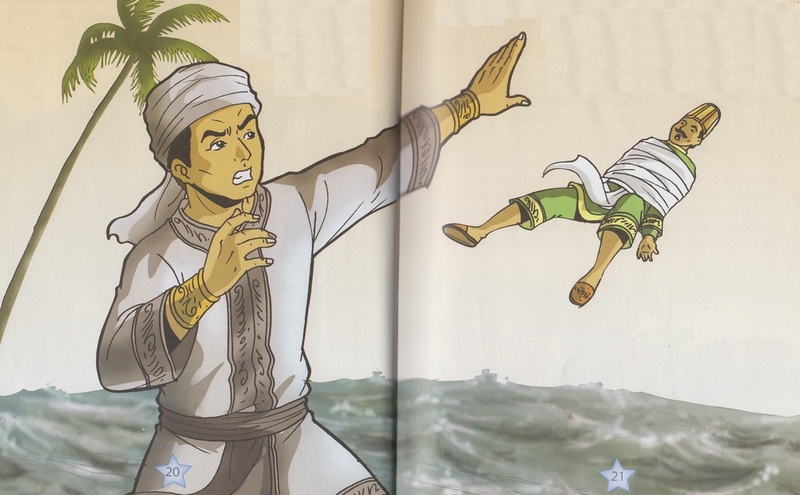 He wore a turban in his head, then he went to the kingdom to save the villagers. The journey to the kingdom was not really good. He had to fought with a forest devil for seven days and seven nights because he didn't wanted to be the devil’s servant for ten years before the devil allow him to passed the forest. And finally Aji Saka won the battle. Finally Aji Saka arrived there, at Medang Kamulan kingdom. But the kingdom was very quiet because almost all of the villagers had moved to other village because they didn't wanted to be the food for the king. While, in the kingdom, the king was so upset and angry to Patih Jugul Muda because there were no villagers to gave to him for his food. But Aji Saka gave his self to the king to be his food. The king asked who Aji Saka was. And he said, “I'm Aji Saka and i give myself to you to be your food,” Aji saka introduced his self. The king just laughed at him and he felt so happy finally he could eat human’s flesh again after for awhile he couldn't. But before the king can eat Aji Saka’s flesh, he had to fulfill Aji Saka’s order. Aji Saka wanted a land as large as his turban. The king just laughed at him and he thought he could gave it to him easily. Heard that, the king agreed and let Aji Saka measured the large of the land he wanted to. Then, Aji Saka putted off his turban and putted it in the ground. His turban was small but it became bigger and bigger as large as the king’s palace. And the turban kept widening until the large was more than the king’s palace. But, Aji Saka just kept silent and stood there quietly. And, his turban started to winded the king’s body but at that time, the king didn't realize it. He realized when the turban was full winded to his body. He was trying to putted it off from his body but he couldn't. Then finally, using his strengths, Aji Saka threw the king Prabu Dewata Cengkar, to the south sea and he lost immediately. Well, the king was died and for the braveness and his services, the villagers made a decision to made Aji Saka as the king of the Medang Kamulan kingdom. And Aji Saka brought his father to his palace. In his goverment, the kingdom became a peace, prosperous, and happy all the time. After a battle between Ajisaka and Dewata Cengkar, which finally was won by Ajisaka, the citizen of Medang Kingdom felt secure from fear. They admired Ajisaka as their hero, Ajisaka event was crowned as the new King of Medang Kingdom. Unfortunately, he had no weapon. As a King, he must have a weapon. He remembered about the dagger in Majeti island. Ajisaka instructed Dora to take the dagger. Dora obeyed what Ajisaka instructed. And then Dora went to Majeti island. At Majeti island Dora met Sembada and told what Ajisaka was said. Dora asked for the dagger. But Sembada refused it. Sembada also said that Ajisaka told him not to give the dagger to anyone except Ajisaka himself. That’s why Sembada refused to give the dagger to Dora. They argued their opinion. Both of them actually was right, because both were carried on what their leader said. Finally, they fought to defend their opinion. Both of them was powerful. They killed each other. Then both of them were dead. Meanwhile, Ajisaka felt that there was something happened. And it was a bad instinct. He finally went to Majeti island to see what happened. He was so shocked when he saw both of his followers were dead. He regretted what happened. To give a honour to Dora and Sembada, he carved Javanese letter in a stone. The letters are : ha na ca ra ka da ta sa wa la pa dha ja ya nya ma ga ba tha nga. ha na ca ra ka : There were two messengers.